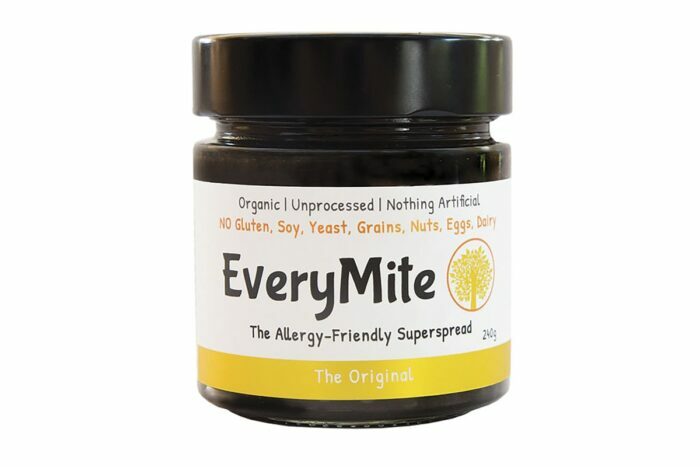 EveryMite is a nutrient dense, unprocessed, and allergy friendly. It contains high-quality nutrient-dense organic ingredients. It has quality organic ingredients that are kept in their raw state to maintain their nutritional value. There is No Dairy, Gluten, Soy, Nuts, Yeast, Grains, Fat, Sugar, Fillers, empty calories, or toxic chemicals. In EveryMite there is Essential Minerals such as copper, manganese, calcium, magnesium, iron, zinc, potassium, selenium; Healthy Essential Mineral Salts; 17 different important naturally Amino Acids; Vitamins such as Vitamin B1, B2, B6 and Vitamin C; Protein; Dietary fibre; Beneficial Enzymes for friendly gut bacteria; and Acetic acid; which then helps your body absorb the important minerals from the foods you eat. Certified Organic Black Sesame Seeds, Certified Organic Coconut Amino Sauce, Certified Organic Himalayan Rock Salt, and Certified Organic Apple Cider Vinegar (with the Mother). Storage: Store in a cool dry place and refrigerate after opening. Shelf Life: The best before date is 24 months from the day it is made. EveryMite is made in small batches on a regular basis. Certified Organic Black Sesame Seeds, Certified Organic Coconut Amino Sauce (Fermented Coconut Nectar, Birds Eye Chilli, Garlic, Onion, Sundried Mineral Rich Sea Salt), Certified Organic Himalayan Rock Salt, and Certified Organic Apple Cider Vinegar (with the “Mother”). Allergy Advice: Contains Sesame Seeds. 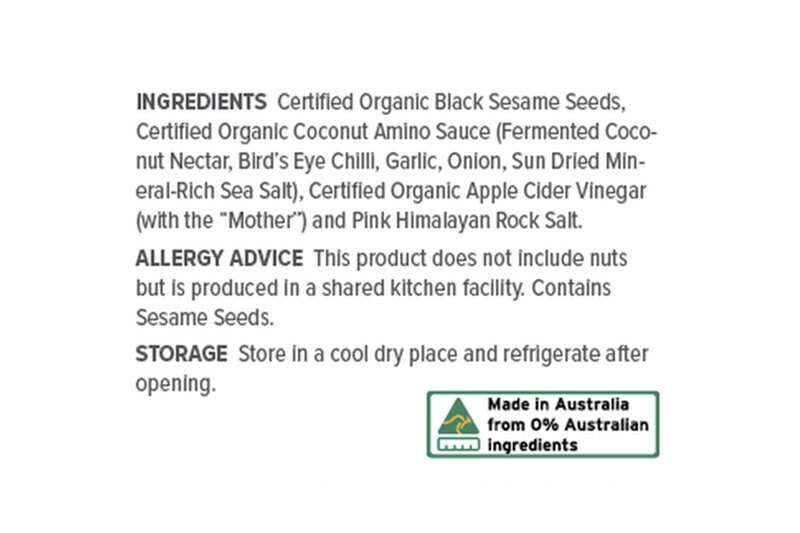 This product does not include nuts but is carefully produced in a shared kitchen facility. it’s made with Certified Organic Black Sesame Seeds, Certified Organic Coconut Amino Sauce, Himalayan Rock Salt and Certified Organic Apple Cider Vinegar with the “Mother”. This organic blend provides naturally occurring minerals, vitamins, amino acids, protein and fibre while the beneficial enzymes for friendly gut bacteria improve vitamin and mineral absorption. What is NOT in EveryMite? 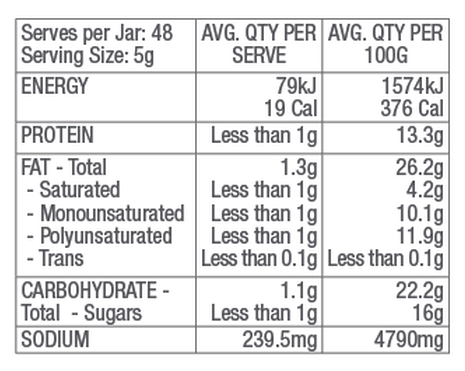 It does NOT contain yeast, gluten, soy, grains, nuts, dairy, added sugar, empty calories, bad fats, fillers and preservatives. Practically everybody can eat it: Vegans, Vegetarians, Coeliacs, Candida sufferers, MTHFR Gene Mutation carriers, people on the Paleo diet, people with a vitamin and mineral deficit, ferment lovers, and organic wholefood and healthy lifestyle lovers. Perfect additive-free alternative to vegemite!